Protected under the dappled shade of tall forest trees, the cinnamon fern (Osmunda cinnamomea) adds a lacy texture to the damp forest floor. Unrolling its fronds from its roots each spring, the stiff, upright spore-bearing fronds mimic the color of cinnamon sticks. Grow it in a moist woodland or near the edges of a stream or pond for a graceful ornamental effect. It is hardy in U.S. Department of Agriculture hardiness zones 4 through 9. Cinnamon fern's native range extends in North America from Newfoundland to western Ontario and south to the American Gulf Coast and New Mexico. The subspecies asiatica grows in eastern Asia. This fern enjoys such a wide natural distribution but only grows in areas where shade, humusy soil and moisture abound. In mid-spring, the fuzzy emerging fronds unfurl, lengthening to 2 to 4 feet. 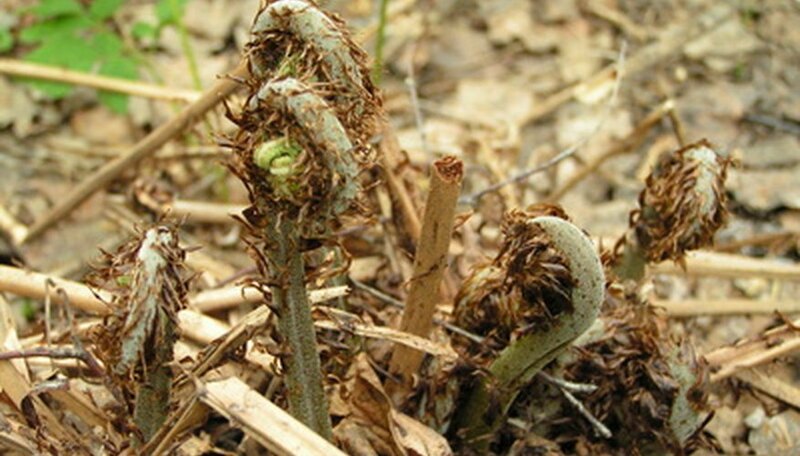 The unrolling frond stems are known as croziers or "fiddleheads." These fronds are light to medium green and are broadly rounded but lance shaped with many leaflets and are sterile. A few weeks later a cluster of fertile fronds emerges from the center of the sterile green fronds. The fertile fronds are stiff, upright and first pale green before becoming rusty golden brown, as they are covered in sporangia that release spores. Ferns do not flower but release spores rather than seeds. The sterile fronds remain until the first autumn frost, when they turn yellow and die back. Plant cinnamon fern in a moist, fertile, humus-rich soil that is acidic to neutral in pH (5.0 to 7.0). If soil remains evenly moist, this fern tolerates upwards of six hours of direct sunlight, but as a general rule, it is best sited where it receives dappled light under tall shade trees. New leaves in spring tolerate significant sunlight initially while waiting for the forest trees to leaf out. Avoid planting it in waterlogged soils. This species is long-lived, and root clumps may be divided in early spring. Small ferns rapidly grow from the shed spores in early summer if soil is moist and out of direct sunlight. Historically, Native Americans used used cinnamon fern to treat rheumatism, headache, chills, colds and snakebites. Frond tips were eaten both raw and cooked. Today the fern is prized as a garden plant and often is grazed upon by hungry deer. The roots are black, wiry and fibrous, and sometimes used as a porous medium to mount tropical orchids. Do not destroy natural stands of cinnamon ferns in the wild for these uses. Harvest the fern croziers in spring as they uncoil, up to a size no greater than 8 inches. Steam or boil them until tender, or serve them hot but al dente. The fiddleheads are edible, tasting like a blend of broccoli, asparagus and artichoke.